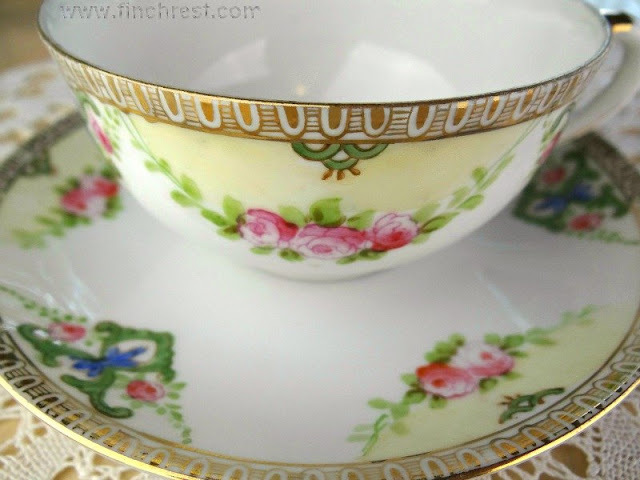 The Nest at Finch Rest: Handpainted Nippon Teacup - wordlessly wow! Gorgeous! Let's have the tea! Michele, your teacup is a little work of art! How pretty the pattern and your photos are lovely. I appreciated your very sweet comment today. Thanks so much for joining me for tea and sharing this lovely treasure with us. Have a wonderful week, my friend. Michele, Your teacup is truly lovely! What a treasure it is. Hope you are having a good week! Yes, please! One lump please. That's a lovely teacup Michelle. Thanks for sharing! Yes, I'm in for tea in that pretty teacup! Beautiful! My favorite artwork resides on teawares! What a beautiful teacup! Wish I could join you! Isn't that teacup just beautiful ??!! Yes, I'd love a cup, please. A pretty teacup Michele, and cute little button you made from the flowers on it. I'd love to join you for tea and always look forward to our weekly gathering. 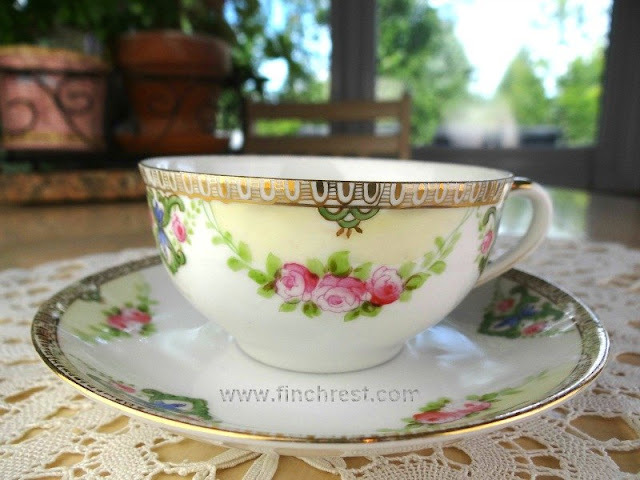 What is it about a beautiful teacup that can just make your day? Thanks! I'll line up with the others, for a spot of tea! Gosh, that is a beautiful teacup! It has such pretty colors on it. I love drinking tea from a real china teacup like that. It just seems to taste better than in a bulky mug! Lovely little work of art. I really like the roses with their soft colors and lovely shadings. What a pretty Nippon cup and saucer! I love the thin delicate cup with all it's very lovely flowers and design. A beautiful cup to enjoy a tasty cup of tea! Just gorgeous! 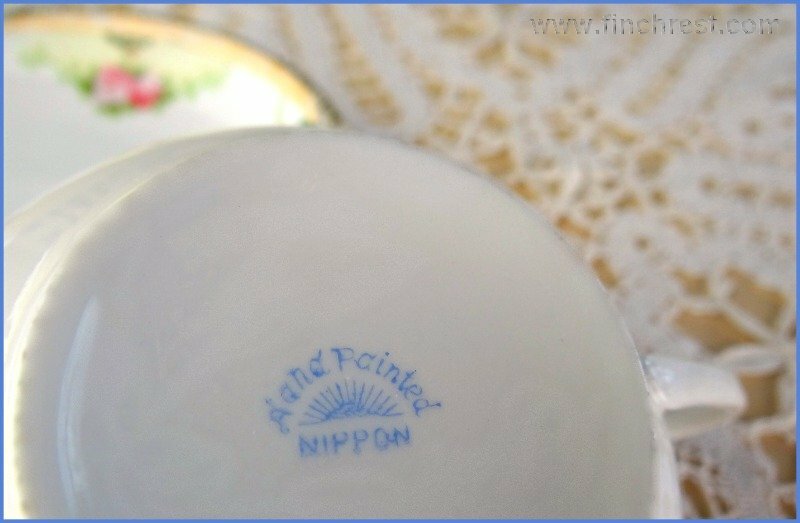 I love Nippon, and your tea cup is a work of art! Oh, I absolutely love your teacup! I found you through Rose Chintz Cottage. Have a wonderful Tuesday! And your photos are great and help her to look fantastic. I needed a little tea this morning. Thank you for this lovely moment. That really is a beautiful teacup and saucer set! I hope you are having a wonderful week! How pretty. My mother would love this. I am coming late, hope some tea is left. Your tea cups are really with a big Whow-effect. Such a gorgeous design. If you allow to use this treasure for tea, I would love to drink a cup. Thank you also for your visit and the sweet comment on my blog. P.S. : The pumpkins are so neat as a fall decoration. Love it.